Since its introduction in 1919, KitchenAid has found its home in the kitchens of passionate cooks and creators, brewers and bakers who use their tools and creativity to continually push what is possible. Its endless commitment to innovation and stunning design comes from building an understanding of makers throughout the years and what they need to fulfill their creative vision in the kitchen. 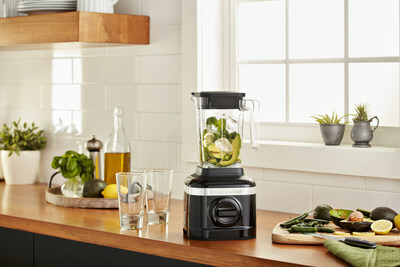 Eating healthy doesn’t have to have obstacles, and KitchenAid is committed to creating fresh possibilities in the kitchen with the new K150 and K400 Blenders. In helping make the desire to eat healthier a reality, KitchenAid engineered two new blenders, keeping the maker at the forefront of the design process. Built on an appetite for innovation, for the past 100 years KitchenAid has developed appliances that provide makers with new ways to explore and experiment. 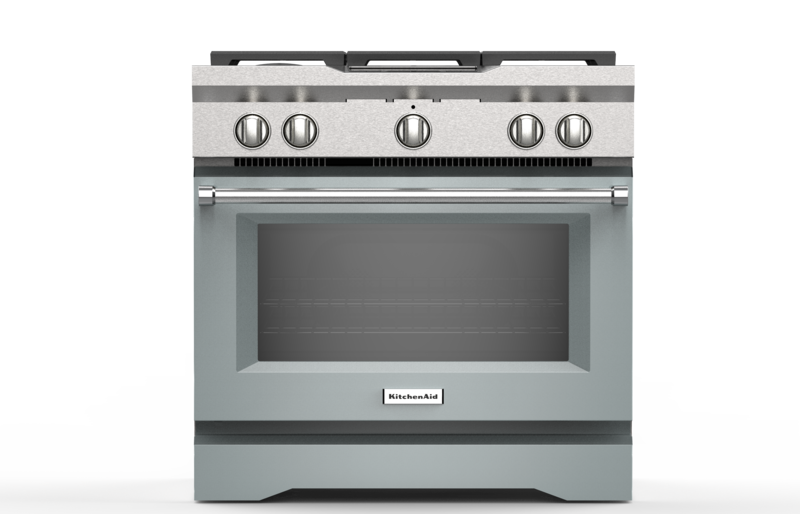 Today, the brand introduces new countertop ovens that give makers the same possibilities as a full size oven with quality results in a convenient countertop size. The new Digital Countertop Oven and the Dual Convection Countertop Oven each can fit a 9×13 inch baking pan, allowing for more space to create and cook. A leader in color and design for the past 100 years, KitchenAid fuels creativity in the kitchen by sparking inspiration among passionate makers. This year, KitchenAid celebrates a century of making and continues to assert its color and design authority through new 5-quart ceramic bowls in Confetti Sprinkle, Parasol, Scandi Floral, Whispering Floral and White Mermaid Lace. KitchenAid knows that flavor, taste and aroma matter the most to coffee drinkers. When creating the new 12 Cup Drip Coffee Maker with Spiral Showerhead, along with the option of a Programmable Warming Plate, KitchenAid ensured that the coffee appliances had optimal flavor extraction, purposeful design for ease of use and a modern and sleek aesthetic to create a countertop showpiece. 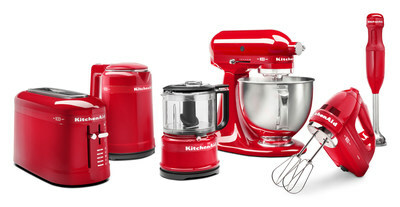 This year KitchenAid celebrates 100 years of making history and, today, the brand debuts its unique 100 Year Limited Edition Queen of Hearts Collection. 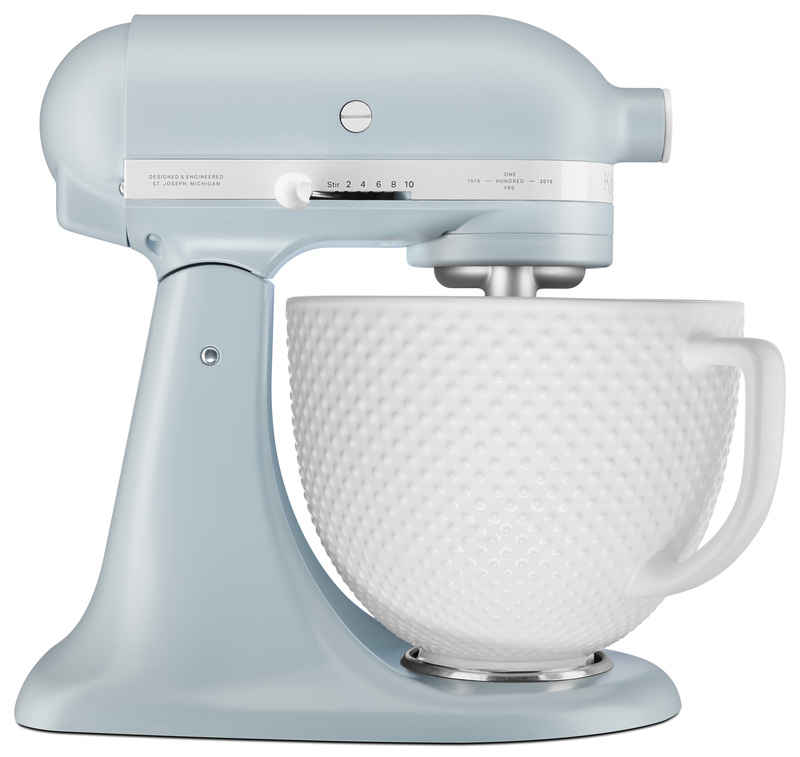 For the past six months, KitchenAid has honored its past with products in Misty Blue, a color reminiscent of one of the first stand mixer colors introduced. Now, with the launch of the 100 Year Limited Edition Queen of Hearts Collection, the brand will look to the future to celebrate the innovation, originality and creativity that will inspire the next century of making. 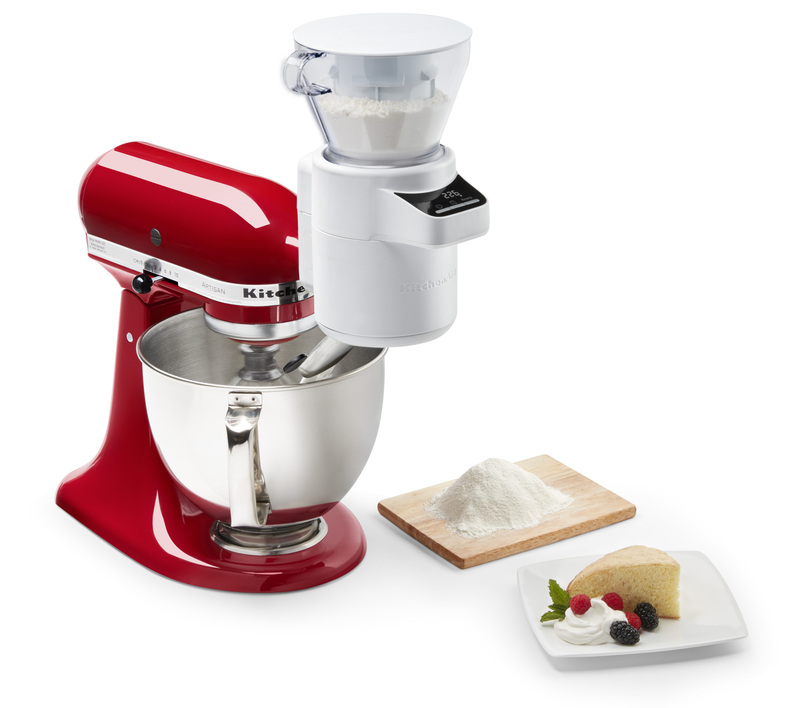 Benton Harbor, Michigan (October 23, 2018)–KitchenAid® created a new Sifter + Scale stand mixer attachment to help passionate home bakers elevate their baking skills just in time for the holiday season. The all-in-one attachment accurately measures, thoroughly sifts and automatically adds ingredients directly into the mixer bowl in just one step. KitchenAid, recognized as one of the most relevant brands in the United States, approaches its centennial year by reintroducing itself through the lens of the maker. Beginning today, KitchenAid celebrates the makers and the marks that define them in a new campaign showing how the brand’s products help bring form to the maker’s vision, no matter where it takes them. 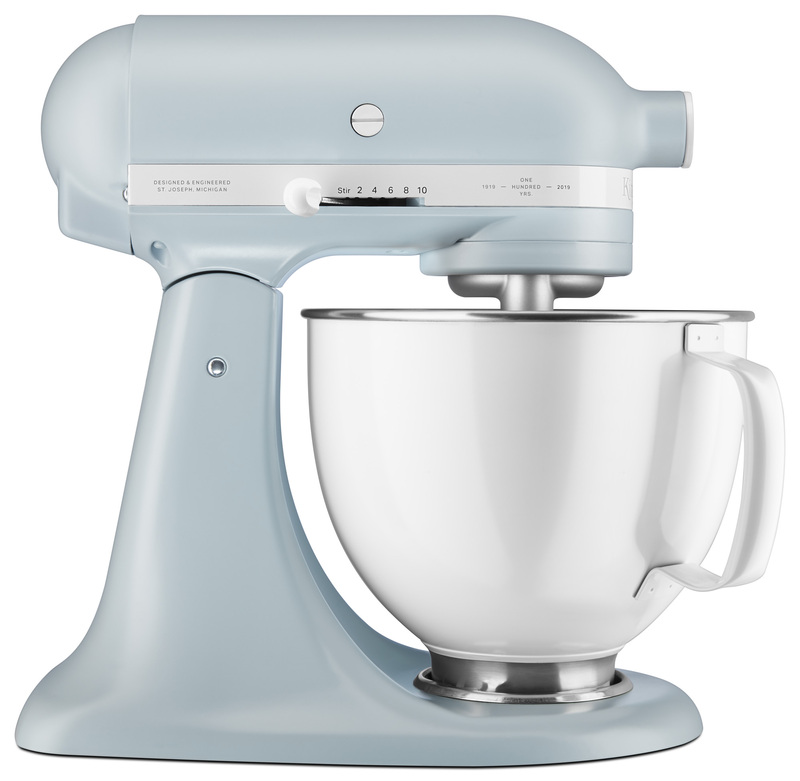 Since its introduction in 1919, KitchenAid has been an icon in the kitchen, and today the brand debuts the heritage-inspired Misty Blue color in select 100 Year Celebration Limited Edition products across countertop and major appliances. With this launch, KitchenAid is inviting passionate home cooks to share in its celebration, honoring nearly 100 years of making. ®/™ ©2016 KitchenAid. All rights reserved. 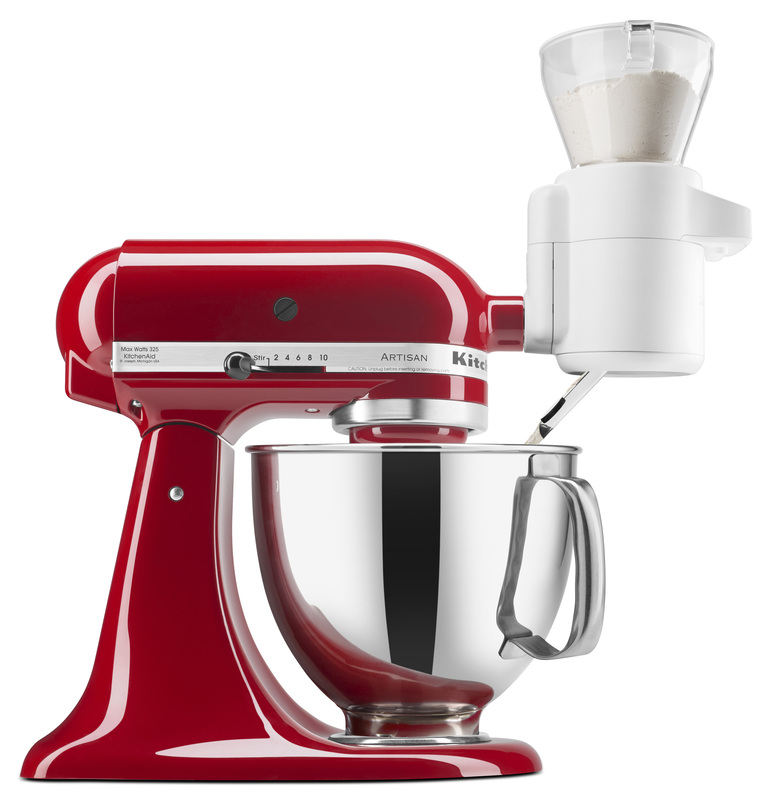 The design of the stand mixer is a trademark in the U.S. and elsewheres.